If you are seeing the following when visiting your website, it means that CloudLinux has stopped the processing of your website due to it reaching the set limit on your account. We use 'CloudLinux' system to ensure that no single hosting account can monopolize server resources to the detriment of any other. You can check your cPanel screen to see the memory, EP and CPU limits which should provide more details to what is being used up. If your site is consistently hitting its resource limits, you may wish to optimize the script you're running on your account, or consider an upgrade. Your site had no issues in the past 24 hours: If you receive this message, your account did not trigger any limits within the past 24 hours. Your site has been limited within the past 24 hours: If you receive this message, your account triggered at least one resource limit within the past 24 hours. cPanel displays additional information about which resource (or resources) triggered the limit. Your site might hit resource limits soon: This message is a warning that your account may trigger resource limiting in the near future. cPanel displays additional information about which resource is at risk of triggering a limit. By default, cPanel displays resource usage information for the past 24 hours. 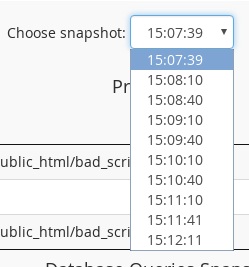 To change the time interval displayed, in the Timeframe list box, select the interval you want, and then click Submit. In the calendar, select the date you want to view. To move to the previous snapshot, click Previous snapshot. To move to the next snapshot, click Next snapshot. PID: This is the process ID. CMD: This is the actual command that the process ran. CPU: This is the CPU usage for the process. In this case, bad_script.php exceeded CPU capacity twice (102% and 101%). MEM: This is the amount of memory used by the process, in megabytes. From this information, we can determine that the PHP script bad_script.php has some sort of problem that causes it to use a large amount of CPU capacity.